The Rip’D Solid is a solid aggressive ball. First couple of shots and I’m thinking, how deep will I have to get to keep this one in the pocket? And will I be able to store enough energy to go through the pins correctly? I am going to like this on Sport shots. 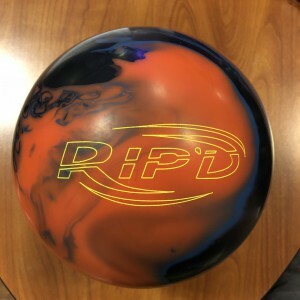 Buy the Hammer Rip’D Solid at PerfactAimBowling.com. Value score is about bang for the buck and solid strong asymmetric reactives in the top lines are always going to struggle for value because they just aren’t as versatile out of box. The Rip’D Solid is not an exception here. You will need to find some oil to use this ball effectively. The Hammer Rip’D uses the new Rip’D Core (Asymmetrical) wrapped by a new solid coverstock called Aggression CFI. Hammer introduces a new core and cover with the Rip’D and Rip’D solid, releasing a shiny hybrid and strong solid side by side. Hammer still has the Gauntlet and Scandal cored balls in the lineup so something’s going to give. The idea is combining those 2 shapes into something new. I believe the shape resembles the Gauntlet more than the Scandal core as it has a bit stronger asymmetric setting motion. Scandal and Gas Mask cores are a little more rolly in nature. The formula is simple. Put a really strong cover on top of an aggressive asymmetric core. The recipe typically results in a ball that requires a good amount of oil. And so it goes with the Rip’D Solid. I started out with my normal release on the house shot and found that similar to the Rip’D, I needed to be a little less rev dominant in my release. Otherwise, the ball rolled out and had a higher tendency to leave corners on this volume. I tinkered a bit to find the right release and depth on the lane. I personally struggle with consistency once I have to get deeper than the 4th arrow and the Rip’D Solid was pretty much forcing me there. I felt a little trapped because I couldn’t be more direct or I would nose up and if I got just a touch too deep with a weaker release, I couldn’t carry well when the ball floats outside. The short version is this is too much ball for me on this house shot. The Rip’D was a much better match up to this house shot for me with the easier length and punch. I threw enough good shots to show you what the ball is capable of going about 24-7. Sean might be happier with that but as a lefty, I don’t want to be there. It’s my own weakness. I compared the Solid and hybrid with the matched release and found the Solid to be about 3 and 2 stronger and earlier than the Hybrid. When using my slightly rev dominant release, the Solid becomes massively stronger, 10 boards with my feet and 5 at the arrows deeper than the Rip’D. Sean was next and he was able to again play zone from about 14 to 6 to 21 to 7. The Rip’D solid is a lot of ball and you can easily see the midlane roll and it was continuous. But this is also more ball than Sean would want to use on this house shot. From tighter lines, he risked 9 pin leaves with very hard drive and when getting in enough to give him room, he risked flat 10 pins because the ball is burning up a bit. Sean found the Rip’D much easier to throw on this house shot. It just stored more energy and with his hand, it opens up the pocket for him. He could use the Rip’D solid if the pattern needs to be settled a bit before switching to the hybrid. When comparing the 2 directly, they Solid is very clearly a 2-3 feet earlier rolling with less angle. Bryan was next. Here’s the thing. Bryan found a line to the pocket. The ball reads the midlane nicely and goes through the pins well. The challenge is that it’s a strong ball that burns up the line relatively quickly. So he had a line and fairly quickly it broke down as house shots do. He tried to move in but hit a wall in terms of finding the energy back to the pocket. Dropping down to the Rip’D was perfect. Again, it seemed that the Rip’D solid looked great with heavy volumes but as it broke down, Bryan would have to quickly find his way to the Rip’D. The Solid was a full arrow stronger for Bryan than the Rip’D. Breakpoints wind up pretty similar because he sets the Rip’D in the dry sooner while the Solid is set in the oil but rolls earlier due to the surface. On to the sport shot and I felt the Rip’D Solid was much more at home for me. I had just used the Gauntlet and I had a good look. I had to get a deeper with the Rip’D Solid and it offered similar control. They both have the same finish. I found the Rip’D to have very slightly less forgiveness from misses out. Misses in would not hold. Sean was next and he had to keep moving in to get lined up. No doubt the Rip’D Solid is a strong ball with a strong motor. You can see it rev up early and it doesn’t want to hold. He finally gets to between the 4th and 5th arrow when he starts to see a place where the Rip’D Solid seemed happy. Since it’s so much ball for him on this pattern, he would rather have a bit less strength and a bit more bite downlane from that depth. For Sean, this would be a monster on long patterns, 48 ft and more because of his rev rate and this ball’s strength. He would be able generate motion where others couldn’t. Finally Bryan. The Rip’D Solid looked amazing for him on this sport shot. This really shows you what the ball is capable of when matched up to the bowler and condition. With his tilt and rev rate, having a strong solid that can generate downlane motion tend to look very good in his hands. He just bumped left from where he was testing the Rip’D and threw 5 strikes in a row. He would have to watch for breakdown as we said previously but he had a really good look. No question, the Rip’D Solid is a big strong ball. It’s got an aggressive cover with a big core. That is a natural recipe for heavy oil if you want all that to store enough energy to hit strong and continuously. On the house shot, all testers felt like there was a decent look but it would go away quickly as the lanes broke down. Sean and I would find this ball too much to start with on the house shot. Bryan could start with it to even out the lanes and quickly go to the the Rip’D. On the sport shot, it definitely showed it’s colors, providing the control everyone wants and needs early in a set when the shot is fresh. Sean would want more volume and more length to start with the Solid. I can start with the Rip’D solid on this shot fresh. The Rip’D Solid would definitely be first out of the bag for Bryan on this. All in all, it’s clear that the Rip’D is a strong continuous ball and with the right volume, it’s going to be a beast. You have to be wary of when it’s passed it’s sweet spot and then quickly jump to the Rip’D. I think it was smart of Hammer to release both pieces giving fans two options with the new stuff, avoiding lots of mixing and matching.